Traveling the four corners of the United States and beyond is a continued passion for most people, and traveling cross-country with your dog can take the experience to whole new heights. Traveling with a dog is not just tossing some stuff in the car and pulling out of the driveway. There are some things that you have to prepare for well in advance before deciding if a road trip with your dog is a good idea. As a human you know what you are undertaking, you understand how much time will be spent in the car, the ever-changing climates and scenery, and the new noises and smells that will be encountered. Conversely, your dog lives in the moment, it does not think ahead. It cannot anticipate that it will be in a long car ride. And, even the most seasoned car-riding dog may not be comfortable stuffed in the back seat of a car for 12 hours as you traverse the country. It would help if you have prepared your dog for the trip before it rolls around so that if an emergency comes up, you can predict how your dog will handle it. The basic necessities seem easy: dog food and medication (if your dog takes medicine). But, that is not all. What is the dog going to eat out of? Where do you store the food? What about water and dog bowls? This all takes up precious space in your vehicle. The best solution is to get a 10-pound sealable food bin for the food, and then within the spare space within the bin, pack any medications. You should also include a Ziploc bag containing vet records, food bowl, water bowl, and collapsible, travel water bowl. Some dogs, especially young ones, will need comfort or enrichment items. Little puppies need to eat several times a day since they are growing at such a fast rate. Pack some snacks in between meals. Include a couple good chew bones (especially for teething puppies), and some comfy bedding to stretch out on. As for enrichment items, some dogs might be content with a bone or chewable item, but think, what will keep your dog occupied or distracted during a bout of bumper-to-bumper traffic. If your dog is a fan of peanut butter, this might be a good time to take a spoonful and stuff it down a hollow bone. Dogs can get distracted for hours trying to get to the very last lick of the stuff. Also, you need to think of the climate that you are traveling to. Will it be cold? If you have a dog with a thin coat, no undercoat, or very little body fat, your dog could get cold very easily. So pack a dog sweater or jacket. Will come back to you in an emergency situation. Off-leash vocal control of your dog is essential if your dog is ever unleashed outside. These behaviors do not have to be perfect, but some are absolutely essential, like waiting to jump out of a car when prompted. If you get a flat tire, pull over to the side of the road, and open your door and your dog automatically follows you, it can be a disastrous situation so close to fast-moving traffic. You need to teach your dog to wait. Period. It will be important for your dog’s safety and mutual happiness if you work on each of these behaviors before starting your road trip. Before travel, make sure that your dog is up-to-date on vaccines and that you have a hard copy of those records. It would also be prudent to get a health certificate from your vet. Health certificates are required to fly a pet anywhere and may be helpful if you are confronted by law enforcement about your dog’s health. It helps to get a thorough physical before we leave. This way you can feel confident that your dog is in peak health before you travel to the unknown and without a regular, known vet to immediately take your dog to. Start small and build up your dog's car legs. Start with nearby daily short car rides to work or the park. Then gradually build up to hour-long car rides to fun places like to a lake or another park. Usually, within an hour from any major city is a nice mountain, river, or lake that would be a great day trip. 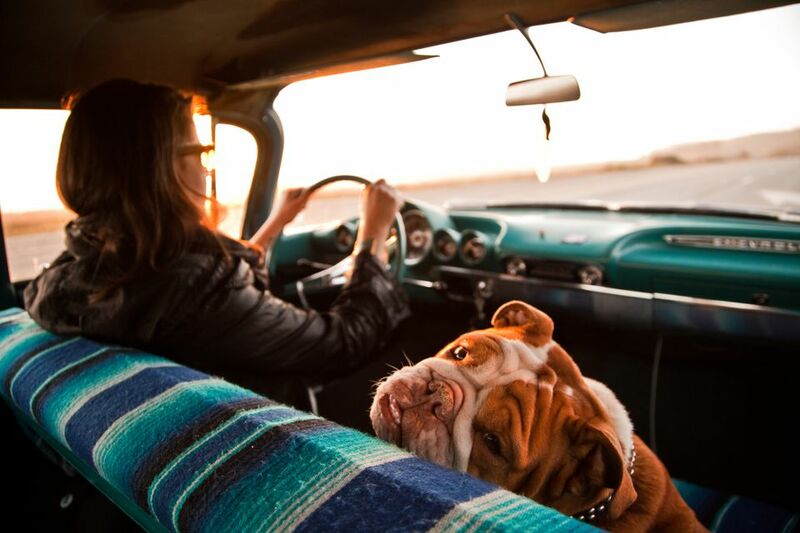 If your dog has not been on many long car trips, make a point to knock one or two that last 5 to 10 hours in duration. Your goal should be to make travel fun for your dog. Before getting in the car, make sure the dog is properly exercised and a bit tired. A great tip: the day before you go on a long trip, treat your dog to a full day of doggy daycare. Not only is it good for the dog, but it allows you to load up the car and clean the house without a dog underfoot. While you do your thing, your dog can play with dog friends all day (perhaps add on a bath or spa time). Get all the things you need to be done without stressing out the dog, and the dog is good and tired for the car ride the next day. It’s a win-win situation. Once you hit the road, take regular bathroom breaks so your dog can stretch its legs and sniff a new state. Treats should be a regular reward for being a good car pal. Keep things fun to make sure that your four-legged companion will always want to hop in the car for the next leg of the adventure.